Get your business online, quickly and affordably. Contact us for a free consultation. Quality web design for affordable prices. All websites are built to look great on any device. Reach customers on Google, Facebook, and across the Internet. Let us help you do it effectively. We strive for excellency in customer service. See what our clients have to say! Exceptional services & highly recommended! My website needed a lot of work, I searched a lot of companies and a lot of people, Middle Tennessee Marketing went beyond and above to do what I wanted with amazing customer care. Patrick B. 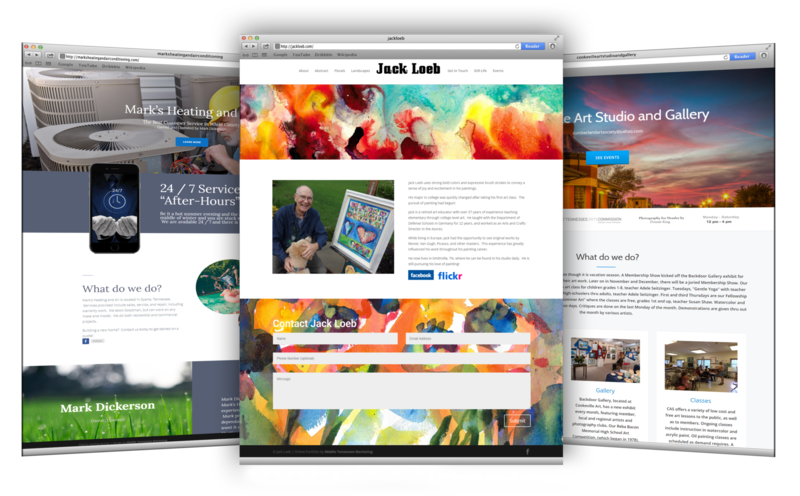 Love the website that Abagail created for me to promote my art. It suits my needs perfectly and was done professionally. I’m very pleased! Betty T.
It all starts with a conversation. We are happy to answer any questions.